Craving Fresh: Trim Healthy Mama - Review and Giveaway! Trim Healthy Mama - Review and Giveaway! Like I told you HERE, my friend Erin mentioned Trim Healthy Mama (THM) to me a couple of weeks ago and got me all intrigued. Mostly because it was a nutrition book being embraced by other Nourishing Traditions type followers. The more I read about Trim Healthy Mama online, the more I wanted to read the book for myself. I ordered a copy through the Book Depository (which still hasn't arrived). Fortunately, as a blogger, I was able to request a copy of the ebook to review from the good people of Welby Street Press. By the time it arrived, I was in a complete tizzy. Rarely have I been so excited about a book, and this one totally lived up to my expectations. I spent every spare minute reading Trim Healthy Mama and was so sad when it came to an end. The 600+ pages are full of wisdom, insight and fun. What is Trim Healthy Mama? Trim Healthy Mama is a nutrition (plus more) book written by sisters, Serene Allison and Pearl Barrett. These ladies have tried many different ways of eating for health, and have finally settled on a lifestyle that keeps them both energised, healthy and trim. Serene and Pearl share all their tips and tricks in Trim Healthy Mama, and I tell you, it is quite an eye opener. It certainly helped explain where my diet has been going wrong, ie. why I'm overweight and tired so much of the time. These ladies have taken the good and sensible principles from lots of different eating styles and put them together into one plan that really works, and is doable forever. As soon as I started implementing the THM principles, I saw improvements in my energy levels and reductions in my sugar cravings. Over the past two weeks I have eaten so well and nourished this baby growing inside of me beautifully, yet I have managed to lose more than 2KG of excess body fat. I haven't been deprived in any way. My body is better fed than it used to be and I'm getting to a healthier size because of it. Can you believe this? This is for real! 1. The foods I eat now don't give me crazy blood sugar spikes and insulin surges, so I'm on an even keel all day and my body doesn't have to try to find places to store extra glucose - like in my fat cells. 2. At meal times I'm not giving my body two energy sources to deal with at the same time - fat and carbohydrates. In one meal I eat more carbs with a little bit of fat, and in another meal I eat more fat with a little bit of carbs. In neither meal are the carbs blood-spiking ones. I've been staying away from sugar, potatoes, white flour, etc, and eating a lot more low-carb vegetables. 4. The Trim Healthy Mama way of eating revs up my metabolism, rather than slowing it down. That's because it's unpredictable. Sometimes fat is the main fuel source, sometimes carbs are. Sometimes meals are calorie laden, sometimes they're light fare. My body doesn't get a chance to adapt, so my metabolism keeps revving. THM also encourages this with the inclusion of metabolic pumping super foods like coconut oil. I love the conversational style and banter of the two authors. Serene and Pearl approach the plan from slightly different viewpoints (ideological versus practical), so there is a lot of sisterly ribbing that goes on. It helps the 600+ pages fly by. I love all the support I've been getting through the main Trim Healthy Mama Facebook group and the New Zealand Trim Healthy Mama Facebook group I've joined. My local New Zealand group has been fabulous for helping me source New Zealand versions of specialty ingredients featured in some of the THM recipes. I love that I can lose weight even while eating rich, satisfying foods. I love that I don't have to deny my sweet tooth. By replacing sugar with stevia, I've been able to make beautiful desserts that don't make me fat. I love that I'm sleeping better on THM, even though I'm 36 weeks pregnant. I love that I don't get crazy, desperately hungry during the day. I eat good, nourishing foods every three hours or so and don't feel the need for anything else. Even if I'm late eating a meal, I still don't feel as ravenous as I used to. I love that through THM I've now got access to a wealth of delicious and nourishing recipes to feed myself and my family. I love the extra chapters on exercise, hormones, marriage intimacy, skin care and how Serene and Pearl got to where they are today. Here are a handful of snapshots I took over the past fortnight, of different meals I've eaten on the THM plan. Breakfast: Trim Healthy Pancakes with raspberry ricotta cream and blueberries. cottage cheese, and topped with lettuce and cucumber. Lunch: Thai salmon and pumpkin soup. Dinner: Cheeseburger Pie (tastes better than it looks). Dinner side: Roast mixed vegetables. Dinner: Millet patties and salad. Sweet treat: Raspberry chocolate brownie. 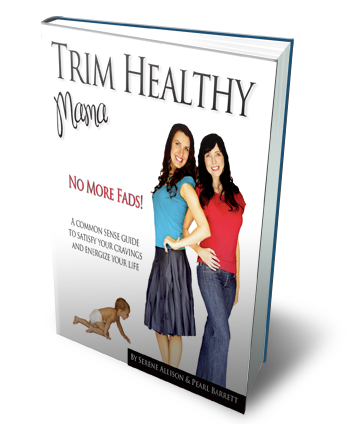 Would you like to win a copy of the Trim Healthy Mama ebook? Just head over to my Craving Fresh Facebook page and like and share the link to this blog post. You will immediately go in the draw to win the Trim Healthy Mama ebook, in whichever version you prefer. I will draw the competition winner at 1pm on Tuesday 27 August 2013. Done, I think. :)I'm getting started on it too! I have hope of losing weight...finally!! :)Thanks for the prod! I did it. A friend of mine has the book and she has already lost 30 pounds using the recipes, etc. from this book. I have looked through her book and the recipes seem easy and tasty. I so hope I win this. very interesting Emma.... and the millet patties have caught my eye because I bought millet and I wasn't sure what to do with it yet! Here's the millet pattie recipe I used. I soaked the millet overnight first and cooked it in chicken stock. That one wasn't actually a THM recipe, but followed the concept. I see one of your recipes is Millet Patties. Is that one found in the THM book or is it one of your recipes? I have a non thm recipe for veggie burgers using millet, but I wasn't sure if it was off plan? Someone told me that millet had to be sprouted prior to use due to glycemic index levels?